Rebellion talks licensing out its vast library of comic book characters. Art above by Tula Lotay, from 2000 AD's excellent 2018 Sci-Fi Special. If you know anything about British developer/publisher Rebellion, you probably know that they own the comic book anthology 2000 AD, on top of making games like Sniper Elite and Strange Brigade. 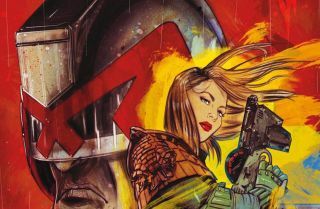 Back in August, I had the chance to sit down with studio co-founder and CEO Jason Kingsley, where I asked him about the process of licensing out stories from 2000 AD's four decades in print. This began back in February 2017, and I was curious to hear about the results. I asked how many games are in various stages of development. "More than one, and less than 12," Kingsley replied. "We've been approached by partners who range from two-man bands to big studios, and each of those will be doing the type of game that's appropriate for them. So the big studios will do big games, and the two-man bands will probably do smaller, pixel-bashed games. "We've seen a handful of them, and they're really good. Very, very early days, and again, things could fall away. Finding the fun in a game takes time. But we will be announcing more about that later. What's exciting is good stuff is happening, and I'm really pleased with it. I trust the team I've got around me to make great games, but working with third parties and saying, 'go play with some of our toys', it's always a bit nerve-wracking because you wonder whether they'll get it. But they do. There's a lot of talented people in the games industry." Kingsley told me that any announcements would follow the launch period of co-op adventure Strange Brigade, which launched its first DLC campaign earlier this week. I asked if Rebellion itself would be publishing the games based on its universes. "Well obviously if we're working with someone working with the 2000 AD licence, it'd be crazy not to look at publishing it. And it would be a funny situation to not want to publish something that was ours. So we're looking at that. Hopefully there'll be more announcements about 2000 AD-based publishing after we've cleared the decks of Strange Brigade, and Strange Brigade's come out and everything is there. "We've got plans for next year and the year after. And the further away they are, the less focused plans have to be, because you're not quite sure what you're doing when, or whether a game will need more time or less time. So 2000 AD has always been a challenge—obviously I've been a reader since 1977. In February 1977 I read issue one, and I've continued to read every issue ever since. "I've always said I wanted to do more 2000 AD-based licences in games, but for one reason or another it's never really happened for us. We did Judge Dredd—we've done several Judge Dredd games—we did a Rogue Trooper game, so we've done a bit, but we've never really done enough. And it's always slightly embarrassing when people ask me, 'why haven't you done more?' Simple answer is, it hasn't happened really. That's when we made the decision to look at external people, and say, 'okay, fine. Here it is officially: if you want to work with 2000 AD licences, brilliant, bring it on, we'll do a business deal, go away and make something really interesting'. And there are people working on things like that, which is very exciting." 2000 AD is best known for the likes of Judge Dredd and Rogue Trooper, but across more than four decades it's published tons more genre stories besides. Kingsley mentions Dan Abnett and Richard Elson's Kingdom as a favourite of his from the last decade or so—I bring up The Ballad of Halo Jones as something I've enjoyed in my recent efforts to learn more about its long history. I'm intrigued to see which of these many stories will eventually turn into games, and which genres they'll belong to. Look out for the rest of my interview with Kingsley on PC Gamer tomorrow, where he discusses the success of Sniper Elite and more.